The Texan Football team defeated the New Mexico Mustangs 58-0 on Saturday at Memorial Stadium. 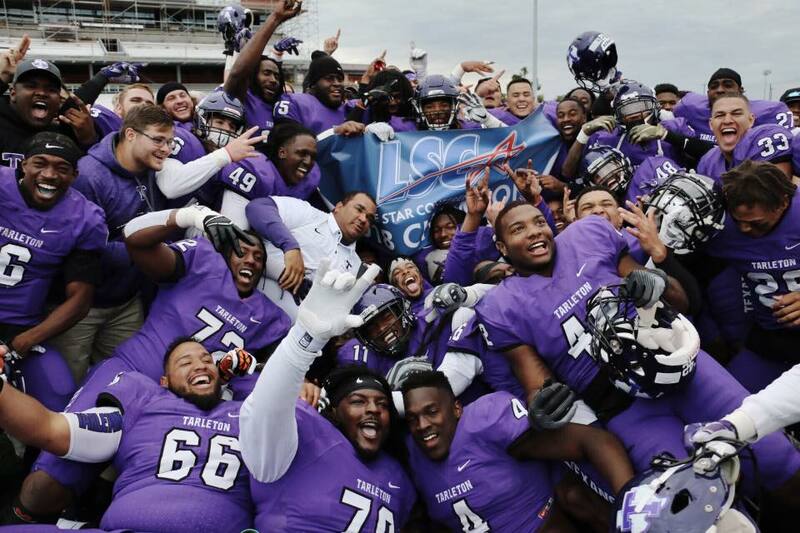 Photo courtesy of Tarleton Sports. 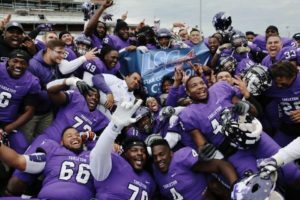 The Tarleton State University Texans made history Saturday when they clinched the Lonestar Conference Champion outright for the first time in program history. The Texans defeated the Western New Mexico Mustangs 58-0 to finish the regular season 10-0. The game started strong for the Texans with No. 21 running back Xavier Turner scoring a 46-yard touchdown within the first two minutes of the game. Turner rushed 100 yards in the first quarter and totaled 172 rushing yards for the game. He scored a second touchdown before time ran out, this time with a 55-yard run. Turner’s final touchdown, a 10-yard run, came in the second quarter. Wide receiver Baxter Kirven also scored a touchdown in the first quarter on a 31-yard pass from quarterback Ben Holmes. Prince Robinson, defensive back, scored two of the three touchdowns in the third quarter. He opened up the second half by returning the kickoff for 92 yards and five minutes later returned an 82-yard punt. The was the first punt returned by the Texans since 2009. Wide receiver DeShun Qualls scored the third touchdown of the second half on a 24-yard reception from Holmes. In the fourth quarter, linebacker Michael Knobloch sacked the Mustangs quarterback for a safety. Running back Bowie Franks scored the final touchdown of the game on a 45-yard run, making the final score 58-0. The Texan defense had their first shutout since 2006, allowing the Mustangs only 239 yards of total offense. Linebacker E.J. Speed led the defense with 11 tackles. Defensive back Ed Hayes had eight tackles and Chris Gordon, another defensive back, with seven. Holmes finished the game with 11 completions and 122 yards. Kirven led the team in receiving with 49 yards. Qualls ended the game with 39 yards. Tarleton is the No. 2 seed in the NCDAA Super Region 4 bracket and will play Azusa Pacific University on Saturday, Nov. 17 at 1 p.m. at Memorial Stadium in Stephenville.